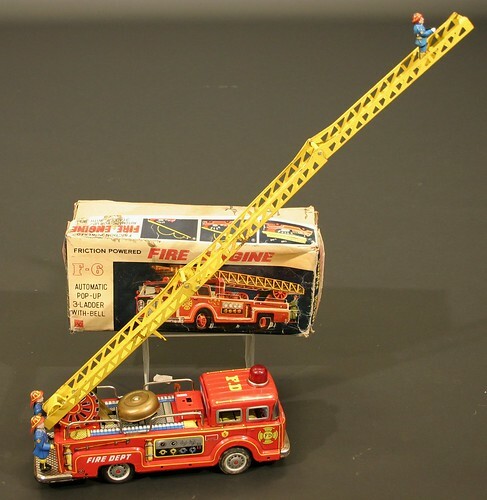 Tin toys from the 1950s and 60s dominate the catalogue for an antiques auction in Cirencester next week. The sale of 157 lots of play-worn toys, amassed by a single collector and including brightly-coloured trains, aircraft, spaceships and cars, make up a third of the antiques going under the hammer at Moore Allen & Innocent’s Selected Antiques Sale on Friday, March 4. The toys come from all over the world – examples from Germany, Japan, Russia and America are all included in the sale. Many are clockwork, battery or spring-operated and perform ingenious functions. 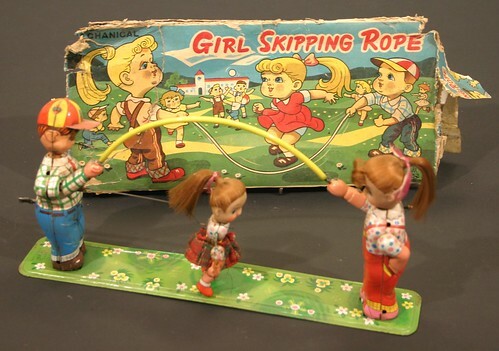 Lot 3, for example, features a little girl skipping over a rope held by two other children (estimate £25 to £35), while Lot 45 (estimate £60 to £80) is a fire engine whose three-sectioned ladder extends automatically while a fire bell clangs, all at the touch of a button. Estimates range from £10 for the smallest, most basic toys up to £500 for highly collectable German Marklin locomotives. While the auctioneers hope that at least some of the tin toys may end up back in a child’s bedroom, the artefacts being auctioned directly after the toys should probably be kept away from little fingers. Standout lots in the china section include three Victorian pieces by Doulton Lambeth, decorated by the renowned artists and sisters Florence and Hannah Barlow. So that they did not compete for clients, Hannah concentrated on decorating ceramics with animals, and Florence painted birds. A pair of ewers with flared rim and looped handle, featuring a quail among long grass and estimated at £180 to £220, is fairly representative of Florence’s work, while a stoneware vase with incised decoration of a sheep and a lamb (estimate £200 to £300) is classic Hannah. 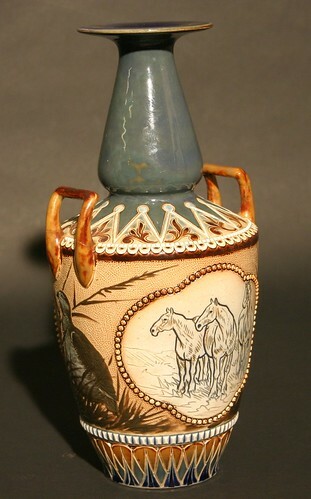 But a piece rarely seen is a vase featuring ponies on one side and a quail among long grass on the other. The base bears the monograms of both sisters, and this unusual example is offered with an estimate of £300 to £500. 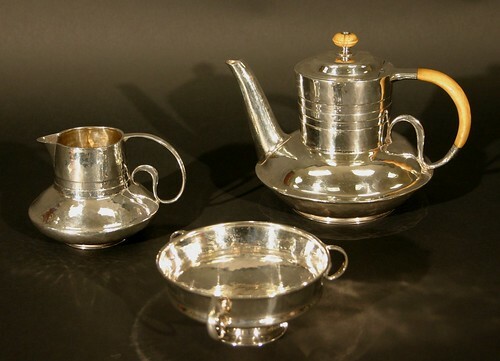 There’s a large silver and plate section in the sale, and prices achieved at auction will probably be higher than the estimates set during the cataloging process just two weeks ago, as the price of silver has rocketed from £14 per ounce to £16 per ounce in just a fortnight. Among the best pieces is an Edwardian Liberty Cymric silver teapot in the art nouveau taste, designed by the renowned silversmith Archibald Knox, and featured in the definitive guide to his work. A bid of £1,000 to £1,500 should secure the lot. In the jewellery section, a circa 1965 gold brooch as a bird resting on a fruiting branch is certain to catch the eye of bidders, sparkling as it is with diamonds, rubies and emeralds. The brooch was a gift to the vendor by the Sultan of Oman, and commands an estimate of £1,000 to £1,500. 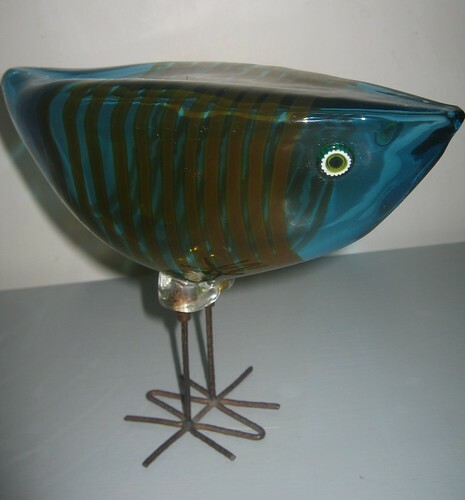 Another bird born in the same year is a Vistosi glass bird by Alessandro Pianon. The abstract striped blue body is supported on wire legs and feet and stands at 20cm tall. Bids in the region of £800 to £1,200 are expected. And continuing the late 20th century theme are a striking rounded-end 1970s Danish rosewood desk by Sibast Mobler, together with a return raised on chrome supports (estimate £400 to £600) and a pair of matching Danish rosewood cabinets by the same manufacturer, carrying a £100 to £150 estimate.